Traditionally eaten as a breakfast food in popular culture, waffles have gained popularity as a dessert in Delhi. Whether they are loaded with chocolate syrup or fruits, they are hard to resist. Recently, Delhi has seen a rise in the demand of waffles with new cafes coming up in every neighbourhood. However, in the NCR region of Noida, there are still only a few waffle places to choose from. 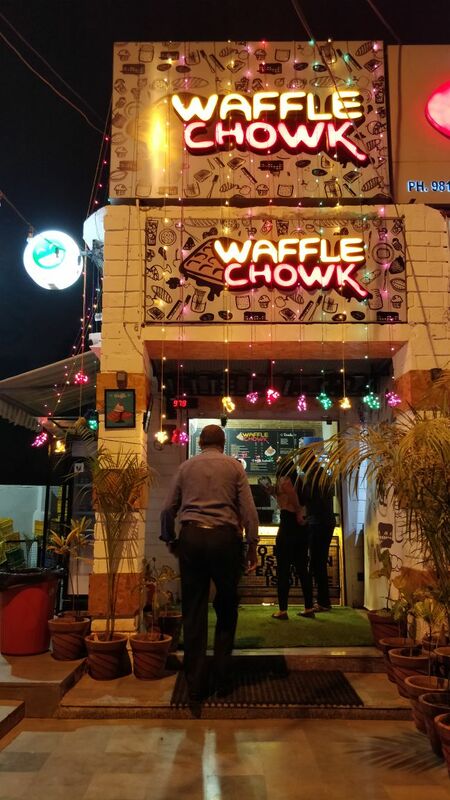 Waffle Chowk was originally a food truck located in Gurugram’s Sector 29. It wasn’t long before it gained popularity and people started dropping by to try out their remarkable waffles and milkshakes. 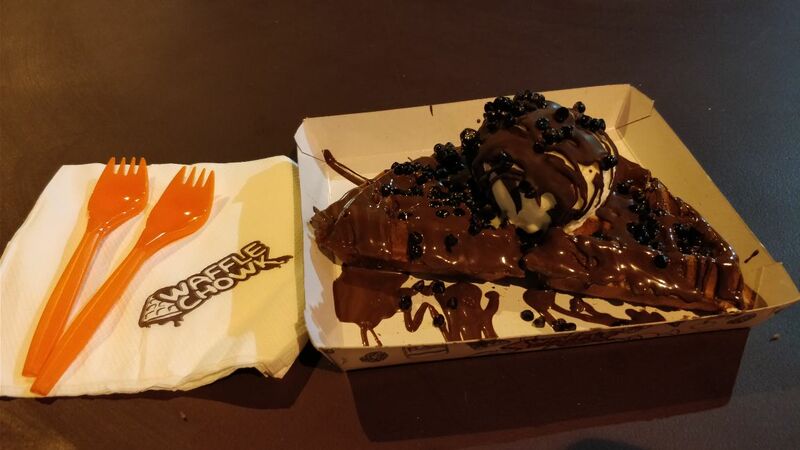 After its major success in Punjabi Bagh, Waffle Chowk decided to branch out and has opened up an outlet in Noida. Located in Sector 28, opposite Brahmaputra Market, Waffle Chowk is a small outlet with outdoor seating. It serves delicious crunchy waffles with toppings varying from the classic maple syrup to the rather innovative white chocolate. One also has the option of adding more toppings and customising the waffle a bit according to their liking. Waffle Chowk’s waffle sandwiches help set it apart from other waffle outlets. People drool over its Nutella and Peanut Butter Sandwich, two things which go perfectly together. If you are unwilling to experiment, the chocolate chip waffle is a safer and equally delicious choice. The waffle is cooked to perfection, having a crunchy texture. It is finished off with a topping of hot chocolate syrup, chocolate chips and a scoop or two of vanilla ice cream, depending on the customer’s choice. A few of the waffles with toppings of strawberries and mangoes are seasonal. One can pair these scrumptious waffles with cold/hot coffee or ice tea and enjoy a wonderful evening indulgence. If you are fond of Oreos, or kit kat or prefer to keep it a little healthy with fruits, there is something to everyone’s liking. 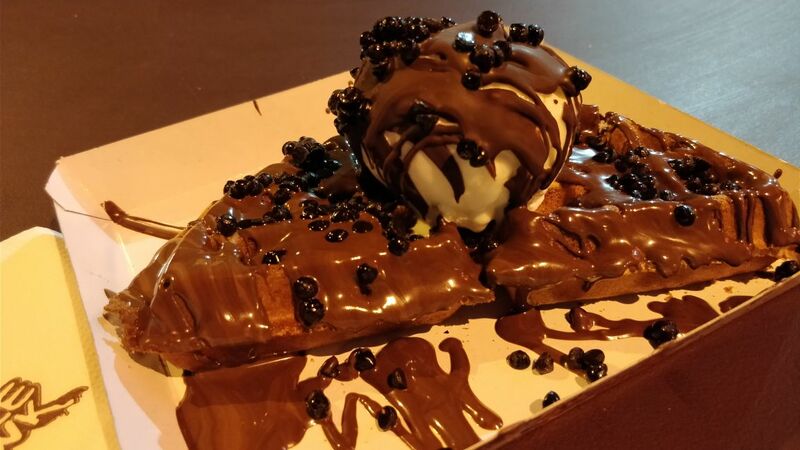 The waffles range from rupees 180 to 250 and each of these is served with a topping of vanilla ice cream. This outlet is run by two people in an organised and efficient manner with the help of token system. The outlet opens up around 11 am, but it takes time to set up and thus service starts only by 12 pm. It does not have a formal seating, but a few tables and chair have been put together as a makeshift seating area. This waffle place is situated close to the Botanical Garden metro station and is easy to spot as well. Being relatively new, not too many people know about this place and so it does not remain crowded. It is a great place to grab a quick bite and satisfy your waffle cravings.